Vandalia is perfectly located to access the interstate system going either north-south or east-west. From Vandalia, within 25 minutes, you can be on four-lane highway on either the Avenue of the Saints (US Hwy 61) or on approach to I-70. Traveling east on Hwy 54 about 17 miles, you come to Hwy 61. 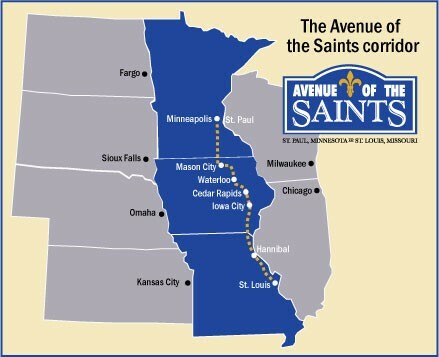 All of this hwy is now four-lane and this section has been designated as being part of the Avenue of the Saints, which is a four-lane corridor running from St. Louis to St. Paul, MN. South of St. Louis is I-55 that runs all the way to the Gulf of Mexico. About 25 miles west from Vandalia on Hwy 54, it becomes a four-lane Hwy, which intersects with I-70 in another 12 miles. I-70 runs coast to coast. U.S.54 effectively serves as a shortcut between a major north-south corridor and a major east-west corridor. Far from the hustle and bustle of traffic near the major metropolitan areas, the ease of Hwy 54’s “No Waiting Access” at on-ramps to major interstates, make transportation a Vandalia, Missouri advantage. The Kansas City Southern Railroad (KCS) provides excellent rail services to Vandalia businesses. The railway runs along U.S. 54 and through the center of Vandalia. Product &/or raw material can be moved by rail to or from anywhere in the continental United States. KSC runs through both Kansas City and St. Louis, where multiple interchanges exist. Additionally, there are interchanges with the Burlington Northern, Santa Fe and the Norfolk Southern within 30 miles east & west respectively. Local switching is available to meet the individual needs of Vandalia businesses. Currently there is one rail spur to the industrial area at the west edge of town. Mississippi River port access is available within 30 miles. The port offers a diversity of services including barge, rail and truck traffic. The Columbia Regional Airport is approximately 52 miles southwest from Vandalia. Airborne Express operates five commercial freight flights per day from Columbia. Pickup for overnight delivery from Vandalia occurs daily around noon. Lambert-St. Louis International Airport is 89 miles southeast of Vandalia. There are a number of air freight handlers and carriers operating at this airport including UPS and Air Cargo Load Master. Mexio Memorial Airport located in Mexico, MO is 30 miles west on Hwy 54 for private planes. The trucking industry has long recognized the value of a Vandalia location. There are many common carriers which serve the Vandalia area. Butler Transport has a terminal right here in Vandalia which has authority for 48 states and Canada. Butler operates a fleet of 140 trucks and does primarily flatbed transportation, although vans are available as well. Another local firm, Stuart Trucking also has flats and vans available. These local firms are ready to serve your needs and are in addition to nationally recognized name often seen in Vandalia such as Yellow Freight, Roadway, ABF,J.B. Hunt, TMC and Schneider, just to name a few. Many of these carriers offer LTL services for your convenience. Various services pick up every day in Vandalia and overnight service is available.